Some people think moldy cheese is gross, but others enjoy its distinct taste and flavor immensely. The National Moldy Cheese Day celebrated on October 9 is the perfect excuse for the latter to indulge themselves with gourmet cheese such as Gorgonzola or Roquefort. Production of a large number of cheese varieties requires mold. It is mold that helps cheese develop a unique flavor. The molds used in cheese making are completely harmless to eat. 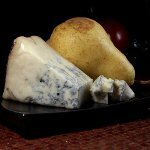 Blue cheeses are often considered “the moldiest” because blue mold is more noticeable than white one. Blue cheeses also carry a more distinct smell than, for example, Camembert or Brie. Blue cheese is veined or spotted throughout with blue, blue-green or blue-gray mold which is a result of the cheese being pierced with strains of Penicillium fungi. Some cheeses have fungi spores mixed in with the curds and others are injected with spores before the curds form. Some of the best known blue cheeses are Roquefort, Gorgonzola, Blue Stilton, Bleu d'Auvergne, Cabrales, Dorset Blue Vinney, Fourme d'Ambert, Stichelton. Blue cheeses typically have salty and sharp flavor. They can be eaten by themselves or be melted or crumbled over or into foods. Blue cheese goes especially well with pears.